Saturday, Nov. 24, 7 p.m.
Local bands abound, but it's rare to stumble across an excellent one whose drummer you had a crush on back in your Snow College days. Originally formed from guitarist/vocalist Jaxon Garrick's solo project, the full Ivouries band now includes Casey Schrader (bass guitar), Adam Fuller (keyboard/synths) and Devin Mitchell (drums/samples), all of whom met at different times in their lives. Their raw emo-pop sound sets Ivouries apart in Utah's crowded local scene. 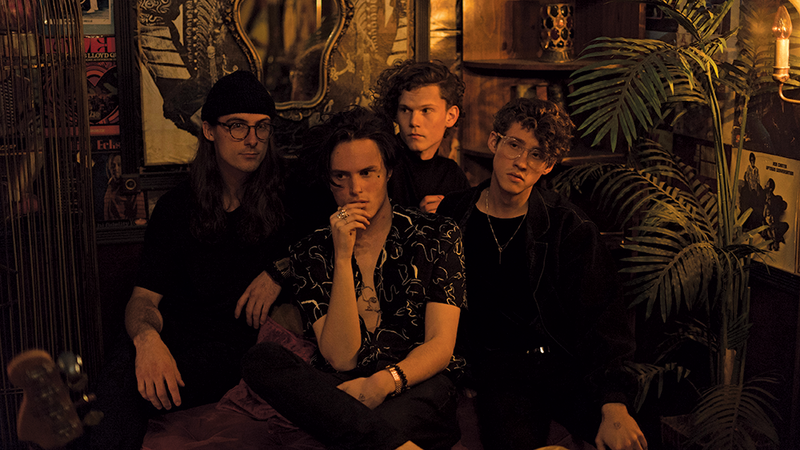 The band members call their genre "gothy pop," with Fuller adding context to the catchy categorization: "Ivouries is dark and energetically raw," he says. "It's a blend of mysterious luxury and pop sensibilities. Our sound heavily relies on synths, drum samples and production experiments." Fuller says that Ivouries' biggest influences include The Cure, Aphex Twin, New Order, Travis Scott, Mitski, Frank Ocean, Brian Eno, Joji, Cindy Lauper and Beach Fossils. With that unique sound comes a unique band name, originally chosenby Garrick. "I thought it looked beautiful," he says. "I loved how the letters looked together—like it could be on the cover of Esquire or something and fit in phonetically and aesthetically." Ivouries haven't made the front page of any glossy mags yet, but they have gone international faster than other local bands: They recently returned from a large international festival in Qingdao, China. While playing with another band at the same festival in 2017, Garrick pushed his own music and got Ivouries a gig for 2018. "China was bonkers in the best possible way," Mitchell explains. "So many amazing people and unforgettable experiences. That festival was astronomically beneficial to our band. We had never played for that many people or on a stage that large before, so the first couple days were a bit of a shock. But by the end, we were all pretty comfortable and confident as a group. Our newly acquired fan base there was amazing, too." Ivouries plan to tour the Midwest as well as the West Coast in 2019, then return to China once more. Until then, they're excited to play a hometown show on Nov. 24 at Kilby Court, their unanimous vote for favorite loca venue. "We have a lot of support in SLC, for which we are very grateful," Fuller says. "Lots of friends and fans are also musicians and artists, and we try to support our friends and their art. The music community is growing and changing all the time, and we try to exist and participate in that community. We also have a decent reach online and are always trying to spread our presence to new people." Opening the show on Nov. 24 are fellow locals Jay Warren and Idan Jene, who Garrick believes are integral parts of that local community. "Jay Warren is incredible," he says. "He's an amazing singer and songwriter—I can't believe he's in Utah. He deserves all the acclaim he gets. He's a world-class artist." Garrick raves about Idan Jean as well, who he describes as next level. "Watching Idan live is unlike anything I've heard or seen before," Garrick says. "He really takes you places with his stuff." Ivouries' new single, "What Did I Say," debuted on Nov. 9 on Spotify, YouTube, Soundcloud and iTunes, reflecting the band's push for bigger success. "Ivouries is going all the way," Schrader says. "We are all excited to keep making music for years to come. We've already had such amazing experiences and have connected with a lot of people, so we are driven to keep that going."